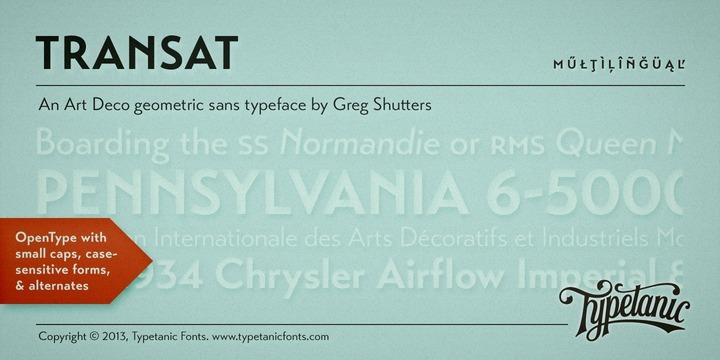 Transat, the strikingly beautiful geometric sans serif typeface was introduced way back in 1930s. The caps of the font are inspired by Art Deco signage that was discovered in the “Gare Maritime” ocean liner terminals. The forename of the typeface “Transat” is an acronym for “Compagnie Générale Transatlantique,” the corporation that manoeuvred stately ocean liners between the period 1862 and 1974. The font embraces a number of OpenType features, such as ligatures (ff/ft/fft), case sensitive forms, small capitals, arbitrary fractions, stylistic alternates, and many more.